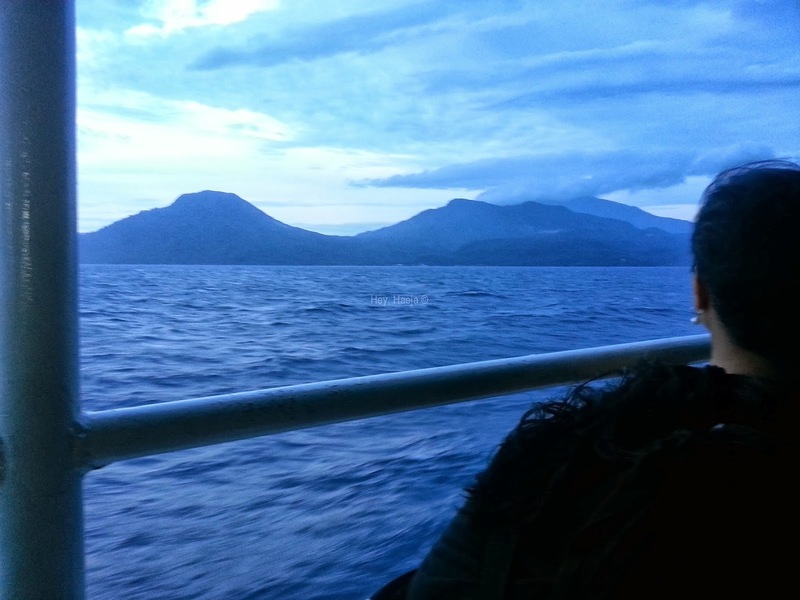 Our first glimpse of Camiguin, while aboard the roro. We booked our flights last June, so we were able to get the air fare for cheap. We left on Friday, September 20, and by Thursday, September 19, everything was solid and planned out, from our itinerary, to our commute time, to the places we’ll sleep in. We were ready, we had our budget down and our money in our wallets. Then the first news came in: Oceanjet cancelled our trip from Macabalan Wharf to Benoni Port. Benoni is the fast craft that leaves from Macabalan, Misamis, to Benoni, Camiguin. The trip via Oceanjet takes about two hours. We really wanted that option since it’s closer to Laguindingan Airport, and we wanted to get to Camiguin before lunchtime since our first day is jam-packed. 1) Book your tickets for Oceanjet via Luzviminda Travel and Tours. According to sir Angelo of LTT, Oceanjet just lets passengers book through tour companies, and not directly anymore. They will contact you with the price, and how to pay. Tickets are non-refundable if you cancel, but they do become refundable if Oceanjet is the one who will cancel due to bad weather. A one-way ride is P990 plus a P20 terminal fee. 2) From Laguindingan Airport, take a taxi right outside the arrival area. If you don’t have a map of Camiguin with you, pass by the Visitor’s Information Area where the nice man behind the desk will give you a free map. You can also ask him for directions where to ride, and which vehicle will take you to where you want to go. 3) Present your Oceanjet e-ticket, and ride the ship, which is scheduled to depart Macabalan Wharf at 8am. So, we had this planned out, but Oceanjet cancelled around 8pm, Thursday. I immediately scrambled to find the clearest instructions to get to Balingoan Port instead, where ferries are usually scheduled to leave every hour. Based on my research, we have several options to get to Balingoan: Take a taxi, which would cost us thousands because taxis apparently don’t like following the metered fare if you arrive from the airport; take a bus to the highway then another bus to CDO, then a jeep to Agora terminal, then a bus from Agora terminal to Balingoan; or a shuttle from the airport to CDO, then a jeep to Agora terminal, then a bus from Agora to Balingoan. If that sounds confusing to you, I was just as confused as you are. Since we have the earliest flight out of Manila, we were thinking we could catch the 10:15 ferry to Benoni, and get to Camiguin before noon. Our schedule will be a delayed, but at least just for an hour. Or so we thought. Really. We got to NAIA 3 by 4am, for our 5:20am flight. Boarding time was schedule for 4:55am. Please note: You do not have to pay a terminal fee anymore, coming from Manila. This should already be incorporated in your plane fare. No tax as well, that just applies to international flights. We had breakfast and then we rushed to our assigned gate, where we found a lot of travelers waiting already. It was 4:50am. We boarded the plane before 5:20am. 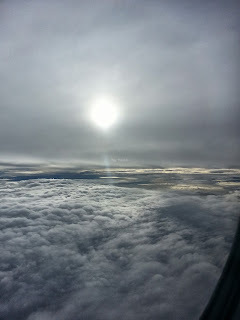 Our flight was delayed, and instead of arriving by 6:55am as scheduled, we arrived past 7am. By this time, I was already praying that we’ll arrive in time to catch the 10:15 ferry, since the next ferry is scheduled to leave by noon, which is much too late for us already. When we arrived at the airport, the guy behind the visitor information area said we can take the shuttle right outside the arrival doors and we can go down straight at Agora terminal. Yes!, I thought excitedly, we can make it on time! Agora terminal – you can buy food and water. The CR is also clean! 1) You can take the taxi, but we took the shuttle by Glorymer (0917 882-9384/0922 866-1591/ 0922 893-8684). They currently have a promo rate of P199, down from P249. You should pay the exact amount, cause they won’t give you change if you pay P200. And when you’re traveling on a tight budget, every peso counts, believe me. 2) Get off the shuttle when you arrive in Agora terminal and go straight for the buses with the sign Butuan (pronounced as Boot-wan). There will be a lot of people crowding you, selling you snacks, and porters trying to get you to ride a shuttle or other buses. Take the air con bus for a comfortable ride – we took the Bachelors Tours bus – the yellow one in the photo). It’s only P148/person to go Balingoan. 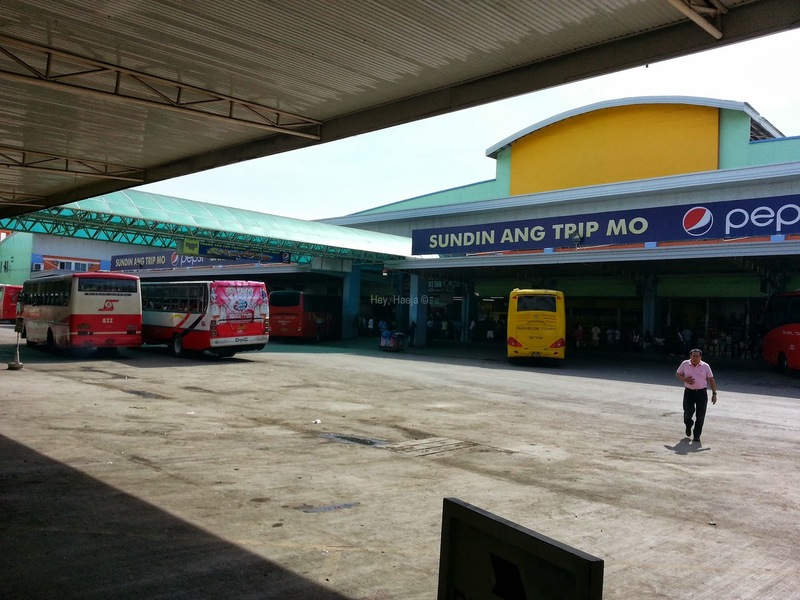 Tell the conductor to drop you off at Balingoan, otherwise you might end up in Butuan! 3) The bus will drop you off at a terminal, and you have to ride a motorela for P7/person. The driver will drop you off at the port, at the place that is currently selling tickets. There are several ferries from different ferry companies, but they are not open at all hours. Unfortunately, the trip took longer than expected and we arrived at Balingoan Port by 10:30am. The ladies at the booth for M.V. Kalinaw said they don’t have tickets to sell anymore, and…they’re not sure if the captain will still push through with the 3pm ferry ride. 1) Several trips the day before, Thursday, were cancelled due to bad weather, so the travelers ate up a lot of the seats for the Friday ferries. 2) There was a convention in Camiguin, and three schools were there. 3) Due to the storm in the country, there were huge winds that made crossing the sea to Camiguin quite dangerous and potentially unsafe. There was one last booth and trip that we could take – our last chance, you could say – to take the 1:45pm ferry by Super Shuttle Ferry 6. Since it was before 11am, I decided the three of us should just take turns standing in line for tickets and eat lunch. Based on all the blogs I’ve read, getting a ticket for the ferry is pretty straightforward. We were not expecting any trouble at all. There were only a few people in line, and no one was muttering around, complaining. The booth was supposed to open at 1am, but the news came they will open at 12:30pm instead. I was second in line, but there were five rows. The people were rattling on the door of the booth to open up and sell us tickets already. I was smack in the middle, and everyone was speaking in Bisaya, and I could not understand anything! I kept asking people around me what was happening and why do the people keep holding on to their IDs. Then the manifesto was brought out (it’s the list where you write down your name so in case something happens, they know you’re on the boat and they can track you or maybe pay your family if you die(?) due to negligence) and there was a mad scramble by everyone to get their names on the list. I thought that if you get your name on there, you’re assured of a ticket. I mean, everyone was just pushing and screaming and shoving. The porters wrote down several names, and I really thought I wouldn’t get a chance anymore. And I was on the second row, for crying out loud! I finally had my chance, after several attempts, and got lines number 50, 51, 52. I thought, okay, so our names are there now, we finally have a seat. Finally! This was at 1PM. Then the people started shoving their money forward to the booth. It was utter madness. I was not able to stand up anymore, I was just moving from side to side because of the crush. And all that time, I didn’t know what the deal was since we were on the list anyway. I just pushed my arm forward and body forward, since I really felt the guy behind me starting to become happy pressed against me, if you know what I mean. After about five minutes of the shouting and shoving, I got the best news ever (say it with sarcasm): the tickets are gone. WHAT?! Are you kidding me?! I wanted to scream. I was in line for two hours (I knew my two other companions might get crushed from the rush or they’ll just get debilitating migraines), I was dizzy, and I felt like fainting, and we were all smelly since we were under the heat of the sun for three hours. It seems like they prioritized the porter, and they only sold a margin of the tickets. At that moment, I wondered what would happen if the ship sinks, and my name’s on the manifesto, and then they’ll show the names on TV and my parents will see our names and they’ll panic…but nevermind that. I ran to the first booth we went to when we arrived. The two ladies were screaming at the other travelers. I stood in front of them and said quietly, “ma’am, wala na po ba talagang ferry? (ma’am, are there really no more ferries? )” The quiet voice (probably coupled with my blouse whose button has come undone due to the shoving, my messy hair, and my huge eyes), worked like a charm. The ladies immediately quieted down and spoke to me gently, “ma’am, 2pm pa po malalaman eh, magttext pa po ang kapitan. Sasabihan na lang namin kayo. (ma’am, we will find out by 2pm, the captain will text us. We will just tell you. )” They let me stay right in front of their booth, so that I can instantly buy tickets if the 3:30pm ferry ride will push through. This was 1:30pm. My companions and I were already making plans to just go to Bukidnon if we can’t go to Camiguin, and just forgo our downpayments to our tour and lodging. Then 2pm rolled around, and yes, there were tickets! The people started screaming again and shoving and pushing, and I was about to get crushed, when the lady shouted at me to just go to the side and she’ll give me my tickets. When I finally got my tickets, the porters around the booth actually congratulated me! Hahahaha definitely an epic moment. The sunset in Camiguin, while aboard the roro. 1) Once you arrive in Balingoan port, go to the open booth, write your name on the manifesto, and pay your ticket. A one-way ticket costs P170. Make sure you know which ferry you will ride on and the time of your ride, since there might be other ferries at the dock. 2) In one of the booths before you enter the gates, you have to pay P2.25. I’m not sure what that is for. 3) Enter the gates, and go to the Balingoan Port building, not to the seats outside the building. You have to pay P2.25 for the terminal fee. 4) Get your bags scanned with the x-ray machine, and enter the terminal. There are no air cons or fans, so make sure to bring a fan if you’ll be waiting long. If you’re really lucky, you don’t have to wait long. 5) Get on the roro when passengers are finally allowed to board. Keep your ticket on hand, as there will be people who will check it. 6) Get off the roro when passengers are allowed to leave. Look for your guide if you already have a tour booked. We booked with Kuya Teddy Pabuluan (0939 244-0521/0906 491-2604). You can also hire a motorela (P1500) or jeep (P1700), with driver. Our ferry was scheduled to leave by 3:30pm, but we left by 4:30pm. I was texting my mom, and she said to enjoy the sunset in Camiguin when we get there. I laughed because at that exact moment, I was already watching the sunset aboard the roro. 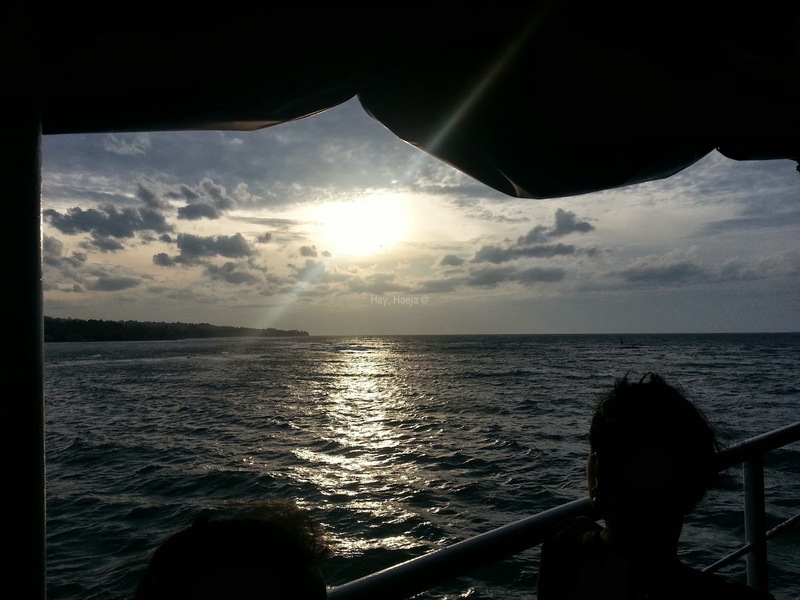 I previously imagined myself catching the sunset in Camiguin…but not aboard the roro. Oh well, it was still such a beautiful, beautiful sight! We finally arrived in Camiguin before 7pm. And right before we got there, brownout ensued throughout the whole island. Aren’t we just lucky? Don’t forget to read more of our adventures in Camiguin over the next few days. Arm yourself with lots of patience, humor, water, wet wipes, tissue, and the best hand sterilizer you have – like Sterilium (call ma’am Cora at 824-1562 for Sterilium). Also, do put on mosquito repellant. Don’t forget your hat and fan. It can get awfully hot, and terminals are not always equipped with electric fans or air conditioning units. If your roro has a third floor (the first floor is for the vehicles, the second and third floors are for passengers), get a seat on the third floor to avoid getting wet from the waves. A native of Camiguin whom I met along the way said the secret is to sit on the middle so you won’t get dizzy. I easily get seasick but I didn’t get seasick, and I was sitting near the railings. I finally figured out that the trick is to watch the rolling sea and waves. For some reason, it helped me not to get seasick. If you easily get seasick, then forearm yourself with anti-motion sickness meds. If you do not speak the dialect, just say “I’m sorry, I only speak English” or “Hindi po ako nakakaintindi ng Bisaya/other dialect (I do not understand Bisaya/other dialect, depending where you are).” But then again, they’ll probably read from your blank look that you don’t understand what they’re saying, and they’ll talk to you in English or Tagalog. Filipinos are usually capable of speaking English, and if you’re in a famous tourist spot, chances are the people around you know how to speak English or Filipino. Talk to people until you find someone who can converse with you in a language you will understand. If your first language is not English/Filipino/one of the local dialects in the country, make sure you know how to speak English, at least, or get a translator. Places in the Philippines are usually pronounced as spelled, or they will correct you if you pronounce it wrong, so don’t be afraid to ask people how to get there. To be safe, ask the security guard or people at the ticketing booths or vendors. Most places only accept the local currency – Philippine peso – so make sure you already have your foreign currency changed. And check first with your hotel/lodgings if they accept traveler’s check. Also, make sure you have coins – pesos and centavos – and small bills if you’re going to commute. You’ll be the one on the losing end if the person you’re paying has no change. Don’t be afraid to talk to the locals or ask them for directions! We Filipinos are usually friendly and helpful by nature. But also make sure to keep your wallets/passports/money in safe places. If you’re going to the beach and you’ll be commuting, keep your fancy jewelry at home. I hope you continue creating this kind of informative posts.